I love granola! I love eating it over yogurt or just straight from the bag. What I don't like about granola is the price that companies charge or the amount of sugar that is in some of them. So I make my own granola! By making my own granola, I can control how much sugar is in it and it is so much cheaper. My granola recipe is so easy to make and I can change the taste of it by adding different fruits and nuts. I make my granola healthier than the store bought kind as I make it with coconut oil and flax meal. I used to not like baking with coconut oil as my coconut oil was solid and I had to melt it before I could use it. I discovered a coconut oil that stays liquid at room temperature and it now makes baking with coconut oil so much easier. This coconut oil is made by Carrington Farms and is a healthier alternative to butter and other oils. My pastor at my church is a on a strict diet because of having high cholesterol and he only uses coconut oil, so I love discovering recipes that he can eat. I know what you are thinking, that you tried other coconut oils and did not like the way it tasted. 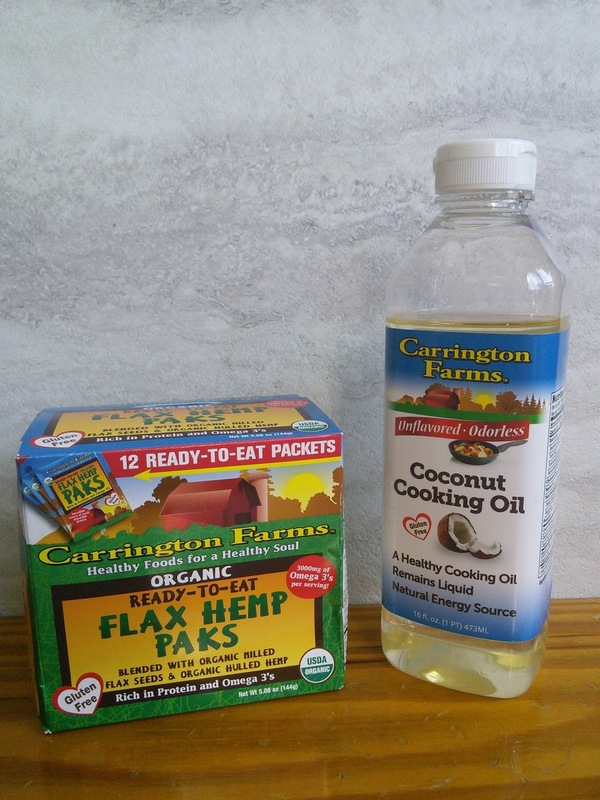 Carrington Farms liquid coconut oil is flavorless and odorless which is a plus for me because my husband does not like the taste of other coconut oils that I have used. If you want flavor, the oil does come in other flavors like garlic, rosemary, and sriracha which would be great to use when cooking. The other healthy ingredient that I add to my granola is flax and hemp seed. I love using flax and hemp seed in my baking as it is an easy way to get Omega-3's into my families diet. I have a family tendency towards high cholesterol and flax and hemp seed is something I use daily in my smoothies to support my cardiovascular health. 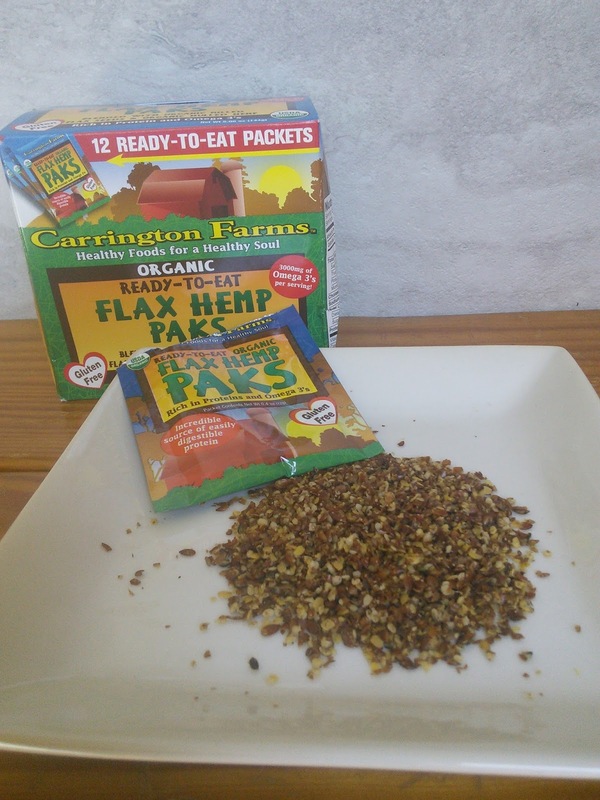 Carrington Farms makes getting your daily dose of omegas easy with their pre-measured packets. I just love that they slice the seeds instead of mashing them to maintain the essential oils and nutrients. These products that I received from Carrington Farms are gluten-free and non-GMO. I have seen the coconut oil and flax-hemp paks at Sprouts. 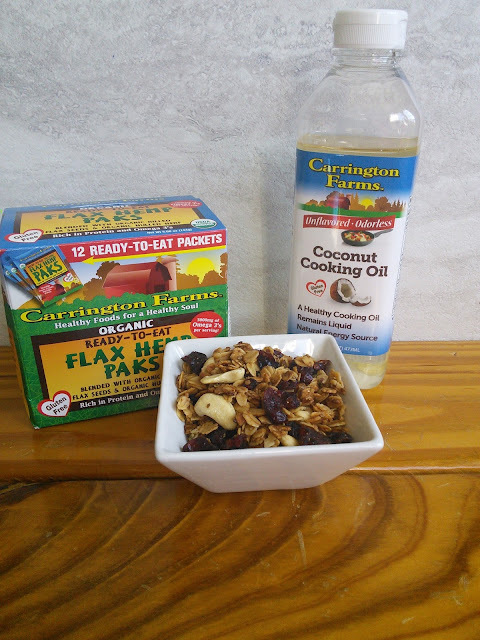 You can visit the store locator on their website to see what stores in your town carry Carrington Farms products. In a large bowl, combine first 4 ingredients, stirring until well coated. Brush a nonstick baking tray with coconut oil then spread mixture onto it. Bake for 30 minutes, stirring every 10 minutes. Let the granola cool on baking sheets. Once cool, pour into a bowl and add nuts and dried fruit. Stir well and cool completely before storing in a container. Enjoy over yogurt. That looks like a great snack for the day - thanks for sharing the info on the products! I love granola in my yogurt. I have it practically every morning. Granola yogurt? This is something I can eat for breakfast. Thanks for sharing. What a tasty and healthy looking snack or breakfast idea! I love granola, too. I haven't used coconut oil to cook with very much but want to start using it more. I like that this one is flavorless. Where I'm not a huge lover of coconut oil (GASP I know!) I think it would be great for granola - thanks for the inspiration! Great mid day power snack. Very great recipe! Living in Arizona I don't have much of a problem keeping my coconut oil in the liquid form. That's what goes with living in the desert. This looks amazing I love cranberry and I love granola so what a great combination! Wow, this sounds so yummy and healthy and easy to make! That's an awesome breakfast right there! I really love anything that has oats and dried fruits, especially yogurt! That looks yummy! 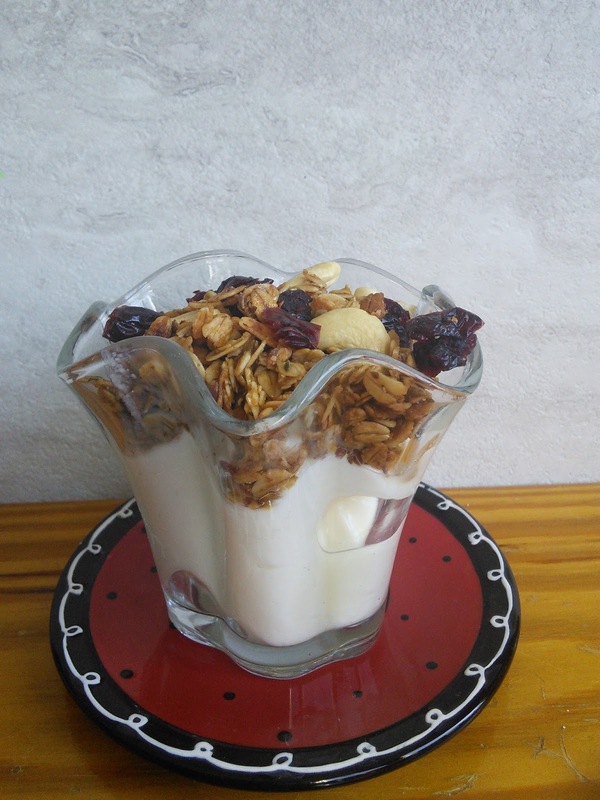 Yogurt and granola go well together, even my kids love this snack. This looks so good! I could eat granola everyday. I also love cooking with coconut oil, but had no idea it could come in liquid form! if this was made into bars i could make this for my son too. I've been using flax lately but haven't tried hemp. Will have to try this recipe. I've never tried liquid coconut oil. I'll have to give your recipe a try once I locate the oil. Thanks for sharing! I love making my own granola. I am going to give your recipe a try to mix things up around here. Yummy! I want to try this recipe with the cashew as y daughter has severe peanut allergy. This looks yummy. I am also discovering many uses for Coconut Oil. Thanks for sharing I will be back for the recipe. That Granola would be a great treat for when I am in the mood to snack. I'm a big fan of granola and yogurt, it is so good. I also love granola with my yogurt; this blend looks / sound delicious! Thanks for sharing -will have to try it! Looks like a good snack!